(takes about 5mins) 12: Put all Oreo's in to a freezer bag (or similar) 13: With a Rolling pin small smash the Digestive Biscuits to powder. 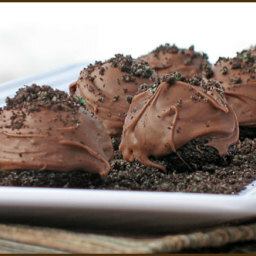 14: Sprinkle Mix over Chocolate balls 15: Place in Fridge again to cool and firm up - Approx 45mins. 16: Eat or Freezer for a laters date! Delicious. It's needs to be set everytime.